We will once again be having a 50/50 split on donated livestock only (corals, fish and plants in good health) for members only. Members must sign in at the donation desk that they want 50% of whatever their livestock items are auctioned for (no reserves). The total of all donations must be greater than $5 and your return check will be available for pickup at the next regular meeting or during our board meeting on July 13th. 2nd Annual PHOTO CONTEST – EXTENDED!!! We have extended our 2nd Annual Photo Contest until October 19th. If you haven’t yet, submit your photos ASAP. Here is the original post with all the info you need. celebrating its 36th Annual Conference, “Coastal Treasures and Troubles”, at the Rachel Carson HS of Coastal Studies, and at the New York Aquarium, both facilities in Coney Island. Keynote speakers, workshops, field trips, evening dinner party and presentation at the NY Aquarium. Get Marinated and join us for this education adventure. Teacher credit available, and a great opportunity for professional networking for career-readiness college students interested in marine science and environmental studies. SECOND ANNUAL PHOTO CONTEST – Take your best shot! We’ve had such great success with our photo contest last year that we decided to do it again. With more categories (19! ), more sponsors and better prizes you’ll be silly not to share your photos with us. Don’t wait, get to work, take your best shot and when ready submit it here. Contest ends midnight Sunday October 13th, 2014. Any late entries will not be considered. Thanksgiving Specials for BAS Members – Don’t miss out. Our new sponsor New Island Aquarium, 1963 Utica Avenue (between Ave. K & L in Brooklyn) – will have a 25% off livestock and a 10% off dry goods sale this Friday [Black Friday]. Mention you’re a BAS member and you will get an additional 5% off any livestock! Brooklyn Zoo & Aquarium, 2377 Ralph Ave. (between Ave. K & L in Brooklyn) – will be having Holiday Sale with discounts on everything! Mention you’re a BAS member and get an additional 10% off. Earn 50%* on donated livestock at November 8, 2013 event. We will once again be having a 50/50 split on donated livestock only (corals, fish and plants in good health) for members only. Members must sign in at the donation desk that they want 50% of whatever their livestock items are auctioned for (no reserves). The total of all donations must be greater than $5 and your return check will be available for pickup at the next regular meeting. FIRST ANNUAL PHOTO CONTEST – Take your best shot! PRIZES – From Sponsors Above – Thank you! $100 worth of HIKARI products. CORALIFE Aqualight & Circulation Pumps, KENT MARINE Reef Salt. CORALIFE Aqualight & Circulation Pumps, KENT MARINE Reef Salt and more KENT MARINE Products. The 1st Brooklyn Aquarium Photo Contest will be announced June 14th, 2013 at the monthly Society’s meeting, all entries will be accepted until September 30th, 2013. The results of the Contest as well as the award ceremony will take place on October 11th at the Society’s monthly meeting. Digital photos must be submitted to BROOKLYN AQUARIUM SOCIETY YAHOO GROUP in JPEG format. Photos submitted must be 6 MP (mega pixel) or greater. As a condition of registration, you will be required to click where indicated to signify that you accept and agree to be bound by these Official Rules. With each submission, participants must include the following: 1) Name of Photographer, 2) Address of Photographer, 3) Phone Number, 4) Email, 5) Category of Freshwater or Saltwater photo is to be entered, 6) Scientific and Common Name of Subject in Photo. > Brooklyn Aquarium Society @ Yahoo Groups < Submit your photos here. To enter, you do not have to be a member of the Brooklyn Aquarium Society or a member of the BAS Forum, contest is open to all, no age restrictions. BAS judging individuals and their immediate family are not eligible. BAS non-members taking part in the Contest and winning a prize for any of the 17 categories will receive a free 1 year membership to BAS. Entries that fail to comply with the Official Contest Rules will be disqualified. Minor digital enhancement is permitted, but images that have been significantly modified or appear unnatural will be disqualified. An individual may submit a maximum of 3 photos per category, any category. Photos must be appropriate for category entered. Photos unrelated to the contest or of questionable content will not be considered. BAS retains sole discretion as to what constitutes appropriate content. Photos must not contain people or other objects other than the subject for the category entered. Contest ends midnight September 30th, 2013. Any late entries will not be considered. Entries will be judged on the basis of photographic quality, and effectiveness in conveying the beauty and/or unique character of the object in their respective categories. A panel of judges consisting of representatives of the Contest’s sponsors as well as members of the BAS Board will judge the entries and all contest decisions are final. The judging panel will select 17 winning entries (one per category). Winners and all prizes will be announced and presented during the BAS October 11th 2013 meeting. Any winner not able to attend the October 11th 2013 meeting, the prize will be kept at BAS until the December 13, 2013 meeting. If the winner/s fails to collect the prize as mentioned earlier, the prize/s will be auctioned at the January 10, 2014 meeting. Entries must be submitted by the original photographer. Do not submit a photo taken by someone other than yourself. You must be the sole owner of the image submitted. By submitting your photo, you guarantee that you are the author and copyright holder of the photo. By submitting, the contestant waives all rights upon submission and therefore has no recourse whatsoever in the use of the photo. BAS is not responsible for computer system, hardware, software, or program malfunctions or other errors, failures, or delayed computer transactions or network connections that are human or technical in nature. Furthermore, BAS is not responsible for: (i) lost, misdirected, misplaced, illegible, unintelligible, incomplete, or late entries or (ii) any act, failure to act, or delay regarding the transmitting or processing of entries. BAS reserves the right, in its sole discretion, to cancel or suspend all or any portion of this contest without notice. BAS is entitled to interpret these rules as needed and its decisions are final. BAS reserves the right to disqualify any entrant that BAS has reason to believe is not the original work of entrant, or does not otherwise meet the contest rules. Earn 50%* on donated livestock at June 14th, 2013 event. We will once again be having a 50/50 split on donated livestock only (corals, fish and plants in good health) for members only. Members must sign in at the donation desk that they want 50% of whatever their livestock items are auctioned for (no reserves). The total of all donations must be greater than $5 and your return check will be available for pickup at the next regular meeting. Thanks to The Brooklyn Zoo for their generous donation and their continued support to the Brooklyn Aquarium Society. Remember to show them your BAS membership card to both show your support and get additional discount. February 8, 2013 Event CANCELLED! It is with deep regret that we must cancel our February 8th “Ponds; the easy way” by Kathy Cardineau event due to severe storm warning for our area. The 50/50 split for livestock only will be at our March event. Please download the latest copy of The Aquatica and our Bulletin for your reading pleasure. P.S. Everyone who has received a bottle of STARTSMART COMPLETE for either fresh or marine aquariums please send your product evaluation to the our P.O. Box or email it to me at JoeGraffagnino [at] yahoo.com. November 9, 2012 Event CANCELLED. It is with sadness and regret that I must cancel the Brooklyn Aquarium Society meeting for this Friday November 9. Due to Hurricane Sandy the NY Aquarium will be closed until the Spring. The Education Hall is being used for volunteers working to repair the aquarium. Any person seeking to volunteer to work as a laborer to help the wildlife survive at the NY Aquarium please go to the Facebook page or the web site of the Wildlife Conservation Society and leave information that you want to volunteer at the NY Aquarium. Someone will contact you. We hope to see you at the Holiday Party on Dec. 14. I am not sure where it will be but I will let you know. Month after month, the Brooklyn Aquarium Society continues to bring you great speakers, auctions, aquarium books and supplies. We even maintain two publications to help everyone become better hobbyists. This is hard work that all of us chip in to make possible, but it costs time and money. The only way we can continue with the high standards we have been maintaining for the past 101 years is by generous donations from manufacturers, stores, and members. We have many members that continue to bring us donations to our monthly auctions. Donations can mean fish, plants, other live stock, old tanks, filters, aquarium equipment: pretty much anything that you have no further use for (but is in good working order). Remember, one man’s unused or unwanted item is another man’s treasure. So dig deep in the back of those closets. I know there are aquarium items you don’t use anymore. If you have bred fish, propagated coral or plants and can spare some, that will be greatly appreciated. Please notify any Board member and we will contact you. You can now download/view/print your own copy of Sponsor Calendar. See all area events happening each month at BAS and all sister societies around the tri-state area. Many thanks to our board member Gene Kogan for creating this nifty calendar. Enjoy, and let us know (by leaving a comment below) if you’d like to see something included/changed. Reef Swap; Sunday, May 20th at Pace University. If you are into saltwater fish and reefs this event is definitely for you. Entrance is $25 per person, children under 16 admitted FREE. Joe Yaiullo – Nutrient control in a 20,000 gallon reef and why this matters to you. Gary Parr – “How’d you shoot that?” has helped thousands of hobbyists across the country refine their photographic skills. Lots of free corals will be given away at our frag demonstration station throughout the day including chalices, soft corals, SPS and more. Don’t wait until the event is sold out! Our own member, Robert Debonis (Big Thanks!) donated a brand new HAGEN GLO T5 36-inch light which will be auctioned at our June 8th event. This great book is finaly available for order directly from Amazon. 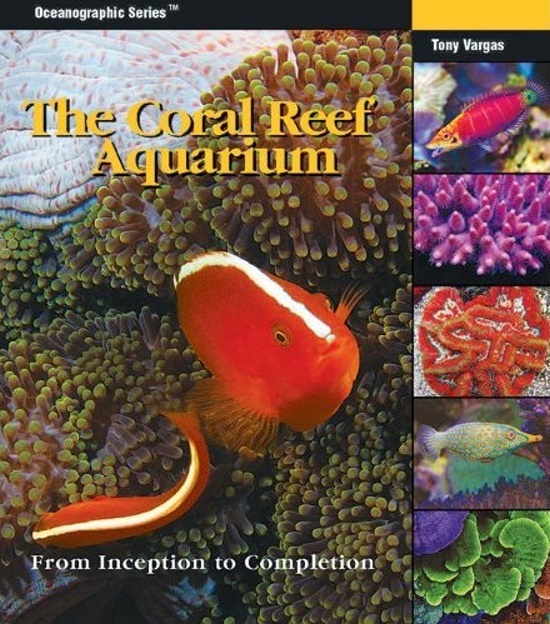 We highly recommend this book to all reefkeepers and those looking to start in saltwater hobby.